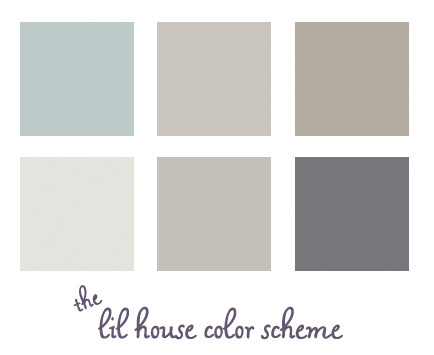 A couple of weeks ago when I planned to do a post with some frequently asked questions, I wanted to include a section for all of the paint colors we’ve used in our house. Mike ended up taking over the post for me when I fell asleep, answering his own version of our FAQs. Since the #1 question I am asked is what paint colors we’ve used in various rooms, I figured it was about time the question received it’s own post! 1. I never realized how well all of our house colors blend together. Since I didn’t really have the whole house in mind when choosing colors, I’m surprised that they all work well! I especially thought the dark gray was bolder and less expected, but even that blends in well. Here is our color breakdown, by room. 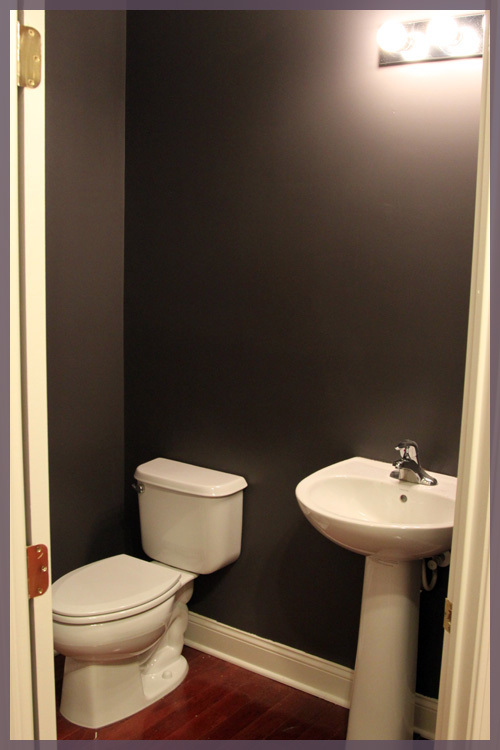 You’ll notice that our recent paint projects have been done with Olympic’s no VOC paint. We try to keep things as toxin free as possible around here since Macky has seizures and we don’t want any unnecessary triggers. Plus those smells just aren’t good for anyone 🙁 The Benjamin Moore paints we used were for rooms we had professionally painted before we moved in so Macky wasn’t exposed to those fumes (we couldn’t paint our two story entryway on our own so we hired it out). We’re trying to decide on a warm grey to use in our living room and I’m really digging your Waynesboro Taupe and Himalayan Trek! I love the paint colors you’ve chosen. Everything looks so cohesive and modern. I want to copy it!! your paint colours are officially the most AMAZING colour scheme i’ve ever seen. i’m currently on the hunt for a colour scheme that will work for us. we have two children, so it’s hard to make everything flow – okay, it’s impossible because their rooms are pink and green, lol. wedgewood grey is on my list of favorite colours. i might ‘follow’ you if that’s okay. I love your paint colors. 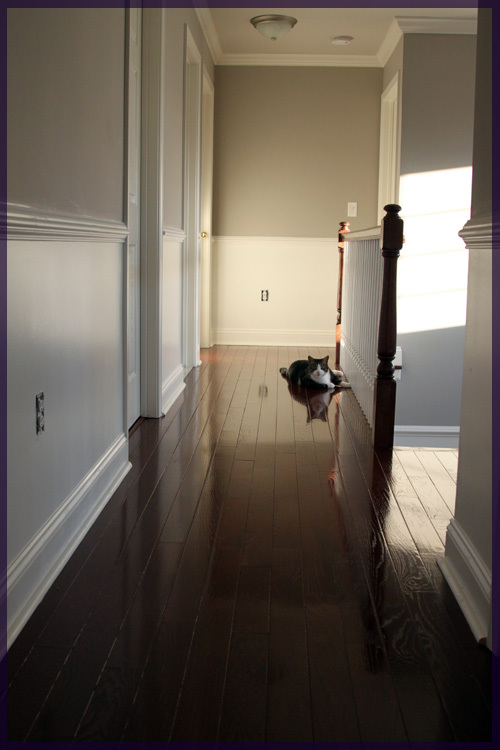 They really allow your beatiful floors to stand out! And great job on your kitchen! What a difference!! I stumbled upon your blog while googling Waynesboro Taupe by BM. 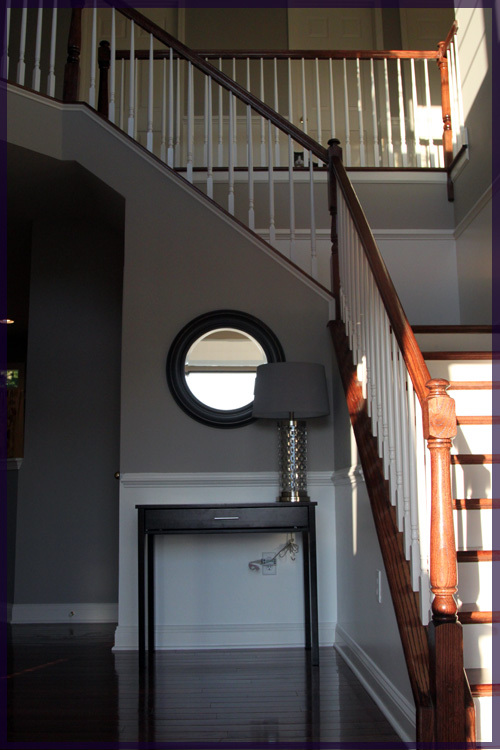 Trying to find a good gray-brown taupe for my DR and a lighter (similar) color for my two story entryway. I do not want any peach or pink/purple undertones. Can you tell me if your DR (Waynesboro Taupe) ever throws peach, pink, lavender? Thanks so much! 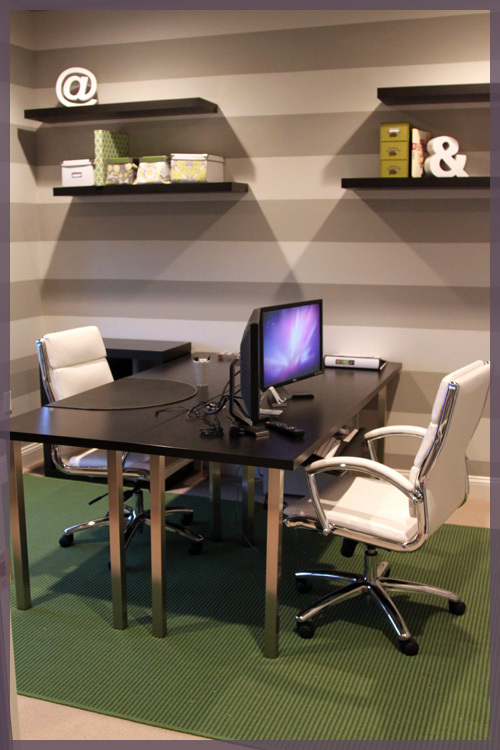 BTW~Your DR striped chairs are the exact fabric of my LR curtains. Trying to find a good gray/blue for that room too! 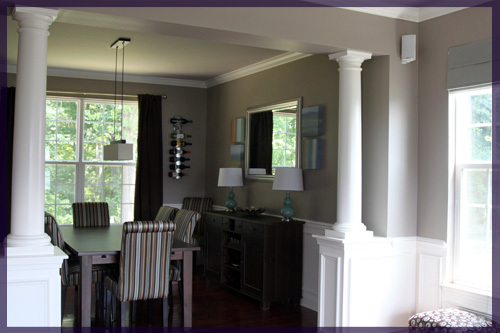 Our living and dining rooms have loads of natural light, so the Waynesboro Taupe never looks pink or purple. Other people have told me that it looks purpley in their rooms though. We have Wedgewood Gray in our kitchen and family room, which is a blue gray but more blue than gray 🙂 If I were to paint those rooms again I’d probably do a color other than the Wedgewood just to get something a little more gray. I am interested in your exterior color combination, can you provide me that information? It looks great!! Hi Cathy! I know our siding color is called Clay, though I do not know the manufacturer. Our shutters and door are Musket Brown. The builder used Duron paint for our entire house, so I imagine the door was painted with the same. I don’t see Musket Brown listed on the Duron website anymore, but if you ask for it in store they may still make it! I’ve also heard that Duron is owned by Sherwin Williams, so maybe they just changed the name. Love your colors! And your house too! 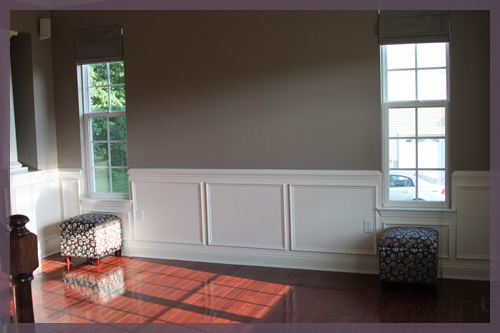 What color is the wainscotting (sp?) in the dining room/living room? Looking to change over my dining room. Thanks Cathy! It’s most closely matched to Crumb Cookie by Olympic. It’s not a bright white and has a subtle gray tinge to it. I am wondering what colours you have chosen for your baby’s room and the other bedrooms?!? I love the colours and am very interested in giving them a try. The only concern is that my space and rooms are not as large as yours seem to be and so I am slightly concerned that what looks so great in your space, may not look so great in mine. Did you use the same colour scheme for your bedrooms? Hi Courtney! Easton’s room is painted with all Olympic paint…. Our bedroom and guest bedroom haven’t yet been painted. The new office is in the process of being repainted, so I’ll update that info when it’s all done! The walls of Easton’s room actually ended up being the same as the lighter stripe in the playroom (former office), so they all do relate at the moment. Hi! I love love love these colors! Definitely a front runner for my house! 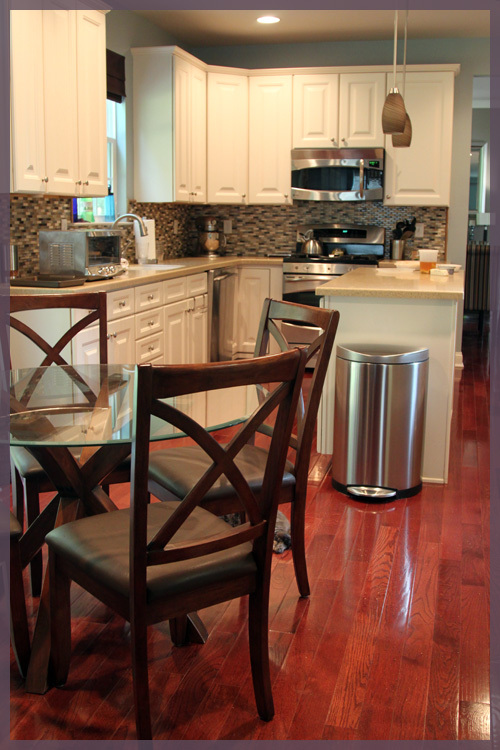 What color did you use for your kitchen cabinets? I’m looking at using Benjamin Moore Stonington Gray (gray with blue undertones) in my kitchen/family room but need to paint cabinets also. Hi! I love your green polka dot closet! Would you mind sharing the colors from that room? Thanks so much! Hi Rebecca. I found your post when I search for colors that go with cracked slate (which is on our accent wall in the family room and I love it). Great color combinations! Can you tell me what kind/color floors you have throughout your downstairs? Thanks! Hi Michelle! We have Bruce oak planks in the cherry color. They’re not as red as they would sound, though the definitely have a mix of reds and browns. I’ve just decided to use Himalayan Trek in my living room and dining room, and I came across your web site when I was showing the color to my husband. I’m wondering what trim color you used with it? Our builder used a Duran paint color that we had color matched to Olympics Crumb Cookie. It’s not a bright white and has a bit of a gray undertone. What a great job. They have personallity but not shock you dead. Again great choices. Ask the contractor to tell you how many labor hours he is estimating for your house. It would be better if the primer has a spraying mechanism. This paint will give your wall a very clean and shine free appearance. I was wondering if you can recommend any shades of blue that would go with your 6 colors. I’d like to paint our guest room and bathroom a blue that would match with your color combinations. site which gives such things in quality? and the traffic that is being driven to their website. 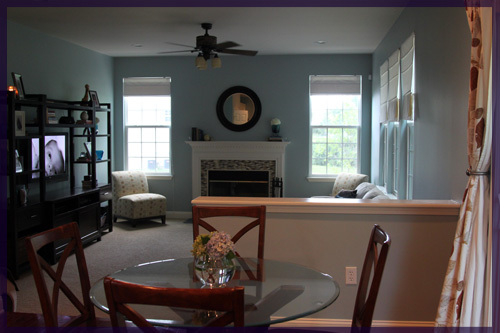 I love the wedgewood gray because it looks amazing and fit in our living room. Thank you for sharing this one. great colour and shades combination in your blog pic .i like your combination. can you suggest me any combination with coffee colour???? great written and come with approimate?y all v?tal infos. I’d like to see more post? like this . Can you tell me the the door color used in the picture of the dark grey house and light blue/grey door? Please respond to the email address above. I’m happy to have written several books that have contributed positively to the lives of many. My works are available in several parts of the world. And I’m currently working with service providers that help people save energy. Being a part of this team has open more opportunities for me to excel as a writer. I have worked with different people and met many clients as a professional. I can handle any kind of writing project and provide nothing but the best. People come to me all the time to ask if I can solve their writing problems and I accept. I find pleasure in helping them to solve their problems as a writer. My name is Eliot Estes. And I am a professional academic writer with many years of experience in writing. I’m happy that I`ve already sold several copies of my poems in different countries like Canada and China and others too numerous to mention. I also work in a company that provides assistance to many people from different parts of the world. Clients always come to me because I work no matter how difficult their projects are. I help them to save time, because I feel happy when people come to me for professional help.